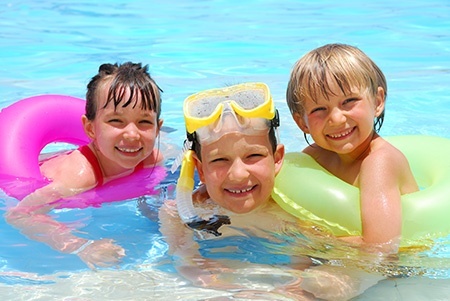 According to the CDC, drowning is the top cause of accidental death for children ages 1 – 4. It is responsible for about 4,000 deaths in the U.S. each year. Teaching young children how to swim and be safe around water can help reduce these numbers. Swimming lessons will teach them how to swim while also educating them on pool safety and common hazards to avoid. Learning how to swim comes with a wide range of benefits. For one, it is an excellent low-impact cardio workout that also promotes strength, flexibility and coordination. It’s a lot of fun, too! Most importantly, knowing how to swim is a life-saving skill. Always supervise your children whenever they are around water. Learn what it looks like when someone is drowning and needs help. Especially with children, drowning is usually silent. Make sure you know how to swim, so you can help those who don’t know how. Learn how to perform CPR. Bystanders may be able to save someone’s life by performing CPR while waiting for the paramedics to arrive. Properly secure any backyard pools with four-sided fencing around it. Wear properly fitted lifejackets when you are boating. Enroll your child in swimming lessons and help them practice what they have learned. The Swim Starters class is designed for children ages 6 months to 3 years old. Instructors use fun, confidence building activities to help children get comfortable in the water. These activities will also help them develop the skills they will need later on. During this class, parents join their children in the water to participate. Instructors will provide parents with valuable information about water safety, drowning prevention and the importance of supervision any time your child is near a body of water. The Swim Basics class is designed for preschoolers from 3 to 5 years old. In this class, students learn how to stay safe around water and are taught basic swimming skills. They will learn how to swim, float, glide, roll, grab, jump, and exit the pool. For information on how to register your child for year-round swimming lessons at either the Centennial Hills or SkyView Y locations, contact us today.